Leverage your company’s slide library in Epoch Slide™ presentation management system. Businesses of all sizes are leveraging specialized technology to attain a competitive edge today. Let’s look at how Epoch Slide™ Presentation Management solves a real and serious problem for training and consulting firms that have accumulated thousands of PowerPoint spreads across hundreds of presentation decks. Every instructor or consultant relies on PowerPoint slides to train their clients in communication. Training and management consulting firms catering to large corporations use PowerPoint slides for effective communication while delivering their message. A small consulting firm of 15 employees can have 3,000 slides requiring a specialized tool to manage those presentation slides and keep them up to date. You can use Epoch Slide™ Presentation Management System to build your courseware faster than in PowerPoint. Simply search the Epoch slide™ intelligent library by keyword to find choice slides for the course lesson you are creating. You can reuse and assemble training modules to compose a custom courseware faster than the current methods available in PowerPoint. SharePoint, FTP, Drive, DropBox, and email are poor tools for managing thousands of slides because they are not designed to be a presentation management system. Imagine having to update 50 new slides created in 2017 across 100 or 200 presentation decks with a library of 3,000 to 6,000 slides. You would copy the required individual or groups of slides, open the target file and paste in each presentation deck. You would then need to repeat the same procedure hundreds of times, possibly opening more than 100 presentation decks, deleting old slides and pasting new slides in the correct order multiple times. Instead of pasting all 50 slides at once in a deck, you must selectively update each deck. This manual process is an extremely laborious and time-consuming task that can easily take a week or more to complete. Even after updating the slides is complete, the inadequate distribution of the slide library throughout the organization and the ability to quickly create custom courseware remains. Now, imagine that Epoch Slide™ Presentation Management System with an intelligent slide library has automated this process, saving you 80% of the required time. By uploading and replacing the original instance of the updated slide, all instances of this slide instantly get updated across multiple decks and become available to users. Furthermore, the process of creating a custom presentation for each opportunity is improved significantly by creating better PowerPoint decks faster. Using your firm’s slide library, you create a custom presentation in hours, not days or even weeks. This is realized because you have access to the entire slide library of approved and final content. You can search the slide library by keyword to find choice slides, assemble the slides in the desired order, save your work and download the presentation to deliver your courseware communication from a laptop. You can also choose to present your training materials using Epoch Presentation™ iPad App. Presentation management systems increase your courseware composition productivity exponentially. Epoch Slide workflow process provides the tools to build custom courseware in record time and is unmatched by any other system or process available in PowerPoint. Epoch Slide™ Presentation Management System is simply a must-have “killer tool” for training and consulting firms looking for courseware management. Companies of all sizes have amassed thousands of slides over the years. The bad news is that these slides are scattered across outdated SharePoint, FTPs, network drives, and shared file systems. None of these systems are designed for presentation management, and none of them have an intelligent slide library. Due to decentralized storage, users have difficulty finding the right slides to build their presentations quickly. Rather than concentrating on building effective presentations, they are searching in multiple locations and asking colleagues for the latest company-approved slides. Even worse, there are duplicate slides in existence that cannot be located easily, so users create yet more sets of duplicate slides. This is very common throughout many organizations that do not yet have Presentation Management System in place. Let’s say you have decided to centralize your PowerPoint Slide Library and start evaluating Presentation Management System for your company. Here are some tips to help you organize your PowerPoint Slide Library for your business teams. The Presentation Management System is either available as managed hosting software as a service (SaaS) or an enterprise license installed on your intranet network web server. Regardless of the platform you choose, you will need to upload your entire slide library into Presentation Management System. The PowerPoint Slide Library is the core of the Epoch Slide™ Presentation Management System. You can build your online slide library folder by folder while uploading multiple presentations. This can be time-consuming if you have thousands of slides and hundreds of folders to upload and organize into a centralized slide library system. In most cases, the slide library is not organized locally, and the administrator tries to upload and organize as they learn to use Presentation Management System. Given the manual interaction of upload, the task completion time increases while you build your library in real time. There is a better way: mapping your slide library locally on your computer. As the slide administrator, plan and build your PowerPoint Slide Library on your desktop with all the folders and subfolders organized for users by topic, subject, etc. Configure the Epoch Slide Autoloader with the account credentials, and select the top folder. Click “Upload” and watch the magic as your entire slide library is automatically replicated in Epoch Slide™ Presentation Management System. Since you are not uploading manually, you can work faster to build your slide library and save weeks of work. The Autoloader will automatically create all folders and subfolders as well as upload presentations accordingly to replicate your slide library online. Once your presentations are in the slide library, you can optimize presentation meta properties and add keyword tags to slides. Presentation meta tags and slide keywords are searchable, so users can find choice slides for their masterpiece. Epoch Slide™ Presentation Management System has many advanced features for its intelligent Slide Library. These advanced features let the administrator optimize the slide library by creating pre-built presentation for users very quickly. In addition to per-built presentations, you tag slides with keywords that help users search and find the right slides quickly. Using a slide library, your business executive teams can build better presentations faster than they are now. Training consultants use Epoch Slide™ to build custom courseware faster because PowerPoint do not have these specialized advanced slide management tools. Our client’s feedback say “we speed up course-building” significantly. Boonton, New Jersey – March 4, 2014 – iClickPoint™ is a startup founded by Web Epoch CEO Rajiv Prasad to provide speaker and sales support by allowing users to create custom presentations on-demand. iClickPoint™, iClickPad™, iCLickPlay™, iClickPPT™, iClickSFDC™, iClickBox™ are a suite of products available as SaaS to enhance the user’s ability to managing a company slide library, documents, and short videos. iClickPPT™ Plugin for PowerPoint now offers presenters the capability of directly uploading to the “cloud” slides and presentations created inside PowerPoint. The plugin provides a permission setting and button for an easy one-click upload to your iClickPoint™ account folder. Once your PowerPoint slide decks are uploaded, you can access the Presentation Composer on desktops, iPads, and HTML 5 Tablets. From here, you can create that perfect custom presentation. iClickPoint™ and iClickPad™ are intuitive and simple to comprehend; users just select folders, presentations, and slides for the exact material they desire. While in iClickPoint™ Composer, users can drag & drop and shuffle their slides into the intro, main and the ending sections. You can customize the welcome slide to include the recipient of the presentation as well as slide data to reflect report specifics. Once satisfied with your presentation, it is fast and efficient to save, download, share a link, or simply use iClickPlay™ to show your work on a desktop, tablet or your iPad with digital video strategically embedded. You can send secure links to your clients or a public link to prospects, allowing them to see the presentation after an initial sales call. iClickPPT™ Plugin for PowerPoint provides CEOs, CXOs, VPs, speakers, and sales executives entry to iClickPoint™ & iCLickPad™ Presentation Builder plus an “enterprise level intelligent slide library” for an affordable price point. “Before iClickPPT™ plugin, this option was not available. Now individuals and small players can enjoy the same benefits that the big teams enjoy with the iClickPoint™ Enterprise,” says mobile and web app developer, Rajiv Prasad. Users get a tremendous back-end administration system that allows for the management of thousands of slides, version control, reports, tagging, templates, masters, short videos and other advanced functions associated with presentations, documents, and media libraries. 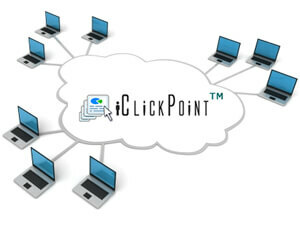 A few years back, several companies started asking for the solutions now provided by iClickPoint™ and iClickPad™. Corporations of all sizes, however, are still using email to send slides and presentation decks back and forth, resulting in enormous wasted space with exponential duplicate files and versions and no inherent order or intelligence. iClickPoint™ and iClickPad™ solve the problem elegantly. A demo reveals the many timely benefits of the new products. Web Epoch Interactive Inc. is based in Boonton, New Jersey. The company develops web tools and mobile applications that help automate business operations. Now celebrating 18 years in business, they create custom solutions for businesses that help provide better service to clients. 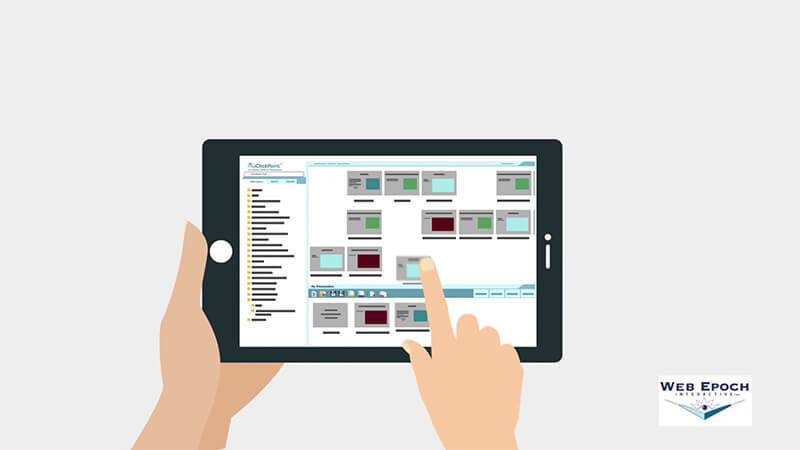 The latest offering is the iClickPoint™ & iClickPad™ intelligent slide library and drag & drop presentation builder. Web Epoch works closely with corporate teams to transfer slides, documents, and other related assets to the iClickPoint™ intelligent slide library to be shared instantly; workgroups can get it anytime, anywhere–whether on a desktop or mobile device. For more information, call 973-335-7775. Email info@webepoch.com to order your Epoch Slide™ presentation management plugin for PowerPoint slide library with an easy to use presentation builder. iClickPPT™ Plugin for PowerPoint now offers presenters the capability of directly uploading to the “cloud” slides and presentations created inside PowerPoint. The plugin provides a permission setting and button for an easy one-click upload to your iClickPoint™ account folder. Once your PowerPoint slide decks are uploaded, you can access the Presentation Composer on desktops, iPads and HTML 5 Tablets. From here, you can create that perfect custom presentation. iClickPoint™ and iClickPad™ are intuitive and simple to comprehend; users just select folders, presentations, and slides for the exact material they desire. While in iClickPoint™ Composer, users can drag & drop and shuffle their slides into the intro, main and ending sections. You can customize the welcome slide to include the recipient of the presentation as well as slide data to reflect report specifics. Once satisfied with your presentation, it is fast and efficient to save, download, share a link, or simply use iClickPlay™ to show your work on a desktop, tablet or your iPad with digital video strategically embedded. You can send secure links to your clients or a public link to prospects, allowing them access after an initial sales call. iClickPPT™ Plugin for PowerPoint provides CEOs, CXOs, VPs, speakers, and sales executives entry to iClickPoint™ & iCLickPad™ Presentation Builder plus an “enterprise level intelligent slide library” for an affordable price point. “Before iClickPPT™ plugin, this option was not available. Now individuals and small players can enjoy the same benefits that the big teams enjoy with the iClickPoint™ Enterprise,” says mobile and web app developer, Rajiv Prasad. Users get a tremendous back-end administration system that allow for the management of thousands of slides, version control, reports, tagging, templates, masters, short videos and other advanced functions associated with presentations, documents, and media libraries. Web Epoch Interactive Inc. is based in Boonton, New Jersey. The company develops web tools and mobile applications that help automate business operations. Now celebrating 18 years in business, they create custom solutions for businesses that help provide better service to clients. 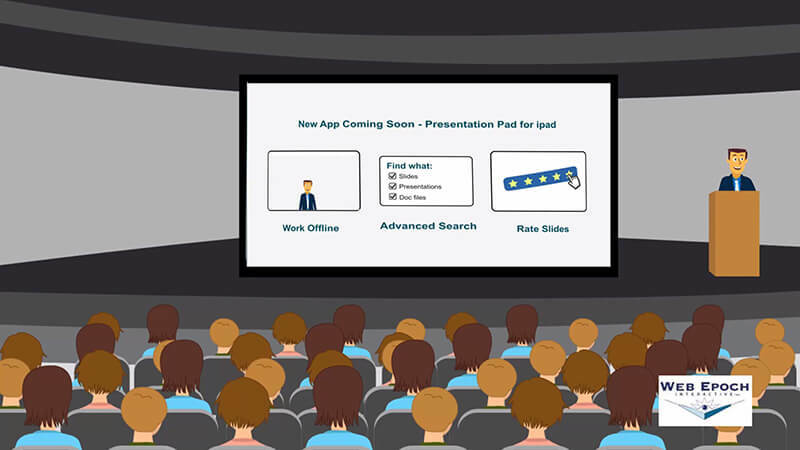 The latest offering is the iClickPoint™ & iClickPad™ intelligent slide library and drag & drop presentation builder. Web Epoch works closely with corporate teams to transfer slides, documents, and other related assets to the iClickPoint™ intelligent slide library to be shared instantly; work groups can get it anytime, anywhere–whether on a desktop or mobile device. Email info@webepoch.com to order your iClickPoint™ & iClickPad™ slide library and presentation builder system. iClickPlay & iPad Saves the Day! iClickPadTM mobile presentation builder got a test drive during a real-life-situation while visiting a client. My MacBook Pro failed to boot due to a short in the power cord. Using my iPad 2, I logged in our iClickPoint presentation management system and was able to access my presentation I created earlier. At this time we are in beta testing however iClickPad let me provide an up close personal presentation on Web Epoch’s capabilities during my meeting. It not only save the day, but demonstrates a perfect example that sales executives and speakers are moving from laptop to iPad, tablets and smart devices to deliver their message. Last Friday I was at a client’s office for a meeting because there was a new VP of program development that wanted to meet with me in person. I took my Macbook Pro, my iPad 2 and iPhone 4s with me as my presentation devices. Before leaving my office I uploaded my PPT presentation to iClickPointTM and saved it so I can pull it up in my iPad for beta testing iClickPad mobile presentation builder and player. Since the Macbook pro failed to get power, I quickly logged in iClickPointTM and began to show my presentation in full screen on my iPad2. I asked my client to sit closer and was able to deliver an intimate presentation of Web Epoch capabilities, some of which he already likes such as the website interactive UI and synchronized presentations we designed and developed for www.rmanj.com. The client’s new interest was mobile apps for eLearning and we were able visit the App Store to see the five star *****review of our StocksandNews iPad app we developed as well as provide a tour of the actual iPad app already installed. I could not have asked for a better platform to present my Web Epoch’s capabilities, if I had planned it from scratch. We created a mobile video that replicated a flash animation which played beautifully on the iPad. The demo was meant for iPhone resolution but the wi-fi connection failed for the iPhone. However the video played beautifully on the iPad and the presentation was powered by iClickPoint & iClickPlay!